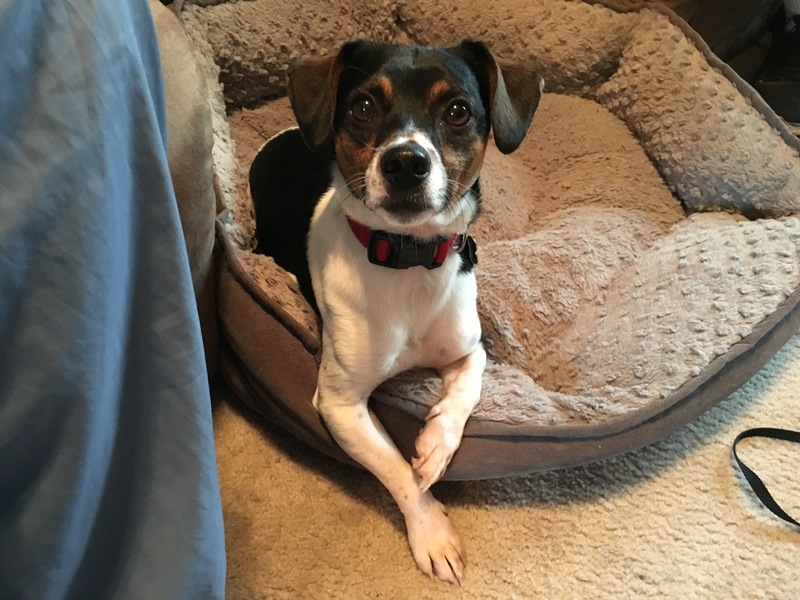 Rusty is a three-year-old Toy Fox Terrier who is fearful of anyone except his guardians; getting over excited when people come to the door. Any time I work with a timid or insecure dog, I want to give them time and space before getting started. Many people attempt to prove to the dog that they are a good person by over petting or enticing with treats. But this often backfires and makes the dog even more cautious or withdrawn. By ignoring the dog and giving it space, I try to get the dog into a completely calm and balanced state. Rusty made it clear he wasn’t pleased that someone new came into his home. As I chatted with his guardians, Rusty paced around the room emitting a low, almost constant growl. It was hard to hear at first it was so minimal. He also carried his body in a hunched over manner with ears back and pupils dilated. After a few moments Rusty came a little closer to me and stood next to his guardian. Almost instinctive, the guardian reached over and started to pet and attempt to console the dog. While its natural for a human to try to console another human who is in pain or distress, this psychology should not be applied to dogs. When a dog is in an unbalanced state and we pet it or give it attention, we are actually reinforcing he behavior we mean to get rid of. I pointed this out to Rusty’s guardians and advised them to avoid this type of interaction in the future. I also recommended that they stop picking the dog up when its reacting or barking at an arriving guest. By picking Rusty up while he was acting this way, his guardians were also reinforcing his unbalanced state. A better technique to use it distraction; especially with an activity that involves getting the dog to move forward like rolling a ball or tossing a stick. Dogs get over things by literally moving forward, and providing he dog with a positive experience it enjoys can help change how it reacts to the same situation in the future. After he stopped petting Riley, the dog went back to disagreeing with my presence. By this time I had been there for nearly an hour so I showed his guardians how to disagree with that behavior. Anytime a dog engages in an unwanted behavior, its important the guardians disagree with the dog right away. Dogs probe to see where boundaries are, so ignoring a dog when its doing something you don’t want essentially agrees with the dog’s unwanted actions or behavior. To help Riley’s guardians better interact and communicate with him, I went over some non verbal communication methods they can use to disagree with him when he starts to engage in unwanted actions or behaviors. Another issue I saw was Riley latching on or gravitating towards his guardians almost as a security blanket. While its important for a human to have a strong bond with their dog, if the dog’s only way of dealing with the unknown is immediate direct proximity with a human, their self esteem can diminish. A dog with lower confidence and self esteem usually develops an entirely different set of issues so I showed Riley’s guardians how to claim their personal space when the dog got too close. Establishing rules, boundaries and limits can be a very effective way to help dogs that are insecure or timid. Just like humans, the feeling of responsibility can come as a heavy burden. By helping the dog see and identify the humans as authority figures, he can take a more passive role which should help him relax. Another great way to help Rusty deal with his anxiety is to ensure that his physical needs are being addressed. Because his guardians have some restrictions, walking the dog hadn’t been a regular activity. Part of the reason for that was Rusty’s behavior on the leash; uncooperative at best. I fitted Rusty up with a Martingale collar and added my special twist to the leash to help his guardians have more control. I took the leash first so I could demonstrate how to keep the dog walking with a loose leash in a heel position. Once Rusty was more comfortable with the Martingale, I passed the leash to his guardian so I could help him better walk and lead the dog. At first Rusty was a little stiff due to being unfamiliar with how to walk in a calm and strutted way, but as we continued you could see him relax and start to take note of his surroundings. Even a short daily walk will help with the dog and guardian’s relationship. On the days when the guardian has more time and energy (He works two full time jobs), longer walks will be even more beneficial. This will give the dog more exposure to people, dogs and experiences that will have a positive impact on his confidence and self esteem. By the end of the session, Rusty was much calmer, was taking cues from his guardians and responding much quicker to their commands and corrections. It will take some time and practice for Rusty and his guardians to get into a habit with these changes, but once that happens everyone’s life will get better.